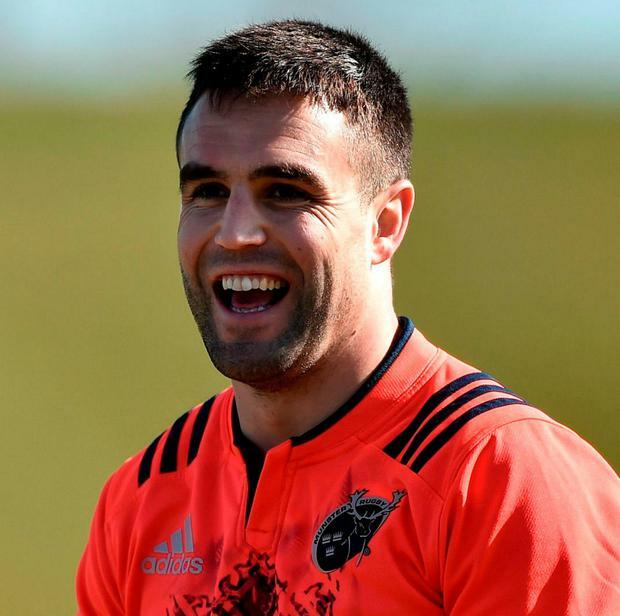 Munster will give Conor Murray every opportunity to prove his fitness for Saturday's Champions Cup quarter-final against Toulouse. The scrum-half took part in training at the University of Limerick yesterday as he stepped up his return from the shoulder injury he suffered against Wales in Cardiff, and a decision on his involvement will be made closer to kick-off. Murray's problem was reported as a "stinger" by the IRFU and he failed to recover in time to be named in the team that beat England last Saturday week. A week and a half later, Murray is still trying to shrug off the issue and with Duncan Williams the only other senior No 9 in the squad, Rassie Erasmus will give him as much time as possible. "We'll give him a chance until Friday, Saturday to recover," said the coach. "He's much better than last week. Last week he was off - five or six of the boys didn't play against Zebre for their rest week. "He's definitely improved a lot, he's going to train (yesterday) in certain parts of the session. Hopefully, he gets the function and power back to play on Saturday. We'll give him until Saturday morning. "He's feeling confident. Our policy is normally that if you can't train on the Tuesday or at least two sessions in the week, we're not going to play you on Friday or Saturday, even if you're an international player. "But as I said to the players, the gap between Conor and Duncan and the younger boys coming through, like Abrie (Griesel), John Poland, Angus (Lloyd)… it's just a big occasion and some of them are still growing in that role, whereas in other positions we are really blessed that if a guy doesn't train on a Tuesday we can put the next guy in. "But after Duncan, other guys can still grow into occasions like quarter-finals, semi-finals. "It is a tricky injury. It isn't something that is serious that can do more harm if he plays but he must be pain-free, he must have full function and range in his shoulder and that affects his passing. It's a waiting game." Keith Earls is set to train fully having overcome the shin problem that saw him come off at half-time against England, while Springbok Jean Deysel's work permit has come through and he is available to play this weekend. Jack O'Donoghue is a major doubt having undergone scans on the hip injury he suffered against Zebre, while Andrew Conway trained yesterday having pulled out of that game. Francis Saili and Ian Keatley are likely to miss out, but Erasmus said he would give the pair 48 hours to prove their fitness as they come back to training.